The ‘Middle Monday’ remains the highlight of Wimbledon besides the finals themselves. A day’s rest for all the players means that all fourth round matches are played in one day – thus a packed schedule. It is perhaps fitting that the first match to be started under the new Centre Court roof would not only feature a British player, but that the match would be a five setter. The first spots of rain to fall on this years’ Championships arrived a few hours earlier during Amelie Mauresmo’s present to Dinara Safina (a set and a break up – then 3-0 up in the third before crumbling like a French baguette). Although only a few spats of rain came down – the roof remained on as a precaution – for the rest of the evening. 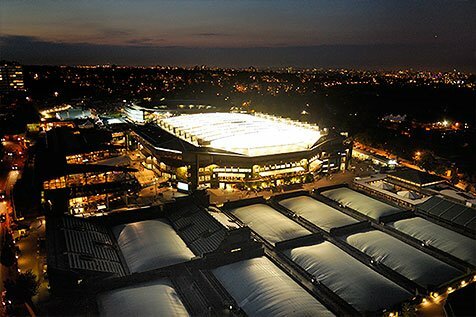 The multi-million pound structure complete with several floodlights would ensure play would continue right into the night if needed – unheard of in Wimbledon’s 132 year history. With the look and atmosphere resembling the great night matches in Australia at the start of the tennis season – Murray’s impressive 2-6, 6-3, 6-3, 5-7, 6-3 victory over the Swiss number two Stanislas Wawrinka – finished at 10.38pm BST. 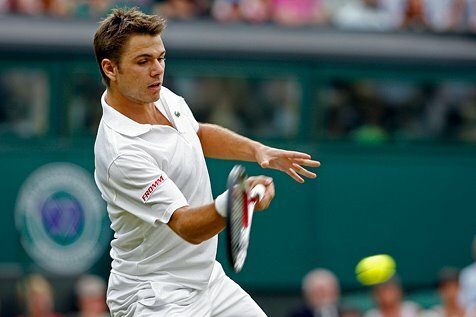 The always dangerous power hitter Wawrinka – whose backhand is bettered only by his fellow Swiss in the top twenty – played a perfect first set before succumbing – partly due to an inability to consistently enforce his game plan, partly due to the pressure. Most of all though, it was a master class in percentage tennis that won the match for the Scot. After being blown away in the first set – Murray employed his game plan which never really looked like faltering despite his opponents glorious risk taking – entertaining groundstroke’s and serve. A few impossible, insane yet identical passing shots (always hit crosscourt from the forehand side while on the run) aside – it was the samey, safe grinding play from Murray which soaked up Wawrinka like an ugly sponge. Clearly effective (especially when blended with Murray’s incredible speed around the court), but hardly admirable in the same way once marvels at the Federers, Santoros, Henmans and Hewitts of the game. With SW19 bathed in moonlight, the last quarter final was decided as Murray joins some stellar names in the last 8. Federer fought past his Roland Garros victim Robin Soderling in three tight sets dictated by serves – something the maestro will be thankful to have practised as he now faces the much lamented Ace machine Ivo Karlovic. A shy man, Karlovic is very likeable – it is a great shame that his game is so dull. 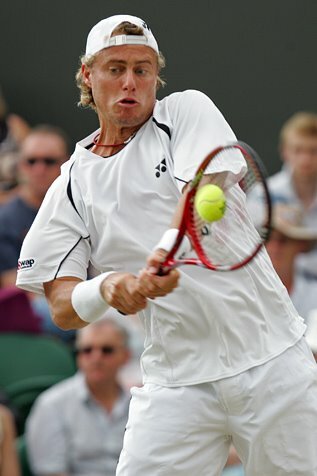 One man that cannot be described as dull however is Lleyton Hewitt (or indeed his fourth round victim Radek Stepanek). Seemingly down and out at two sets and a break behind – the Aussie Rotweiller scampered his way to a five set victory of his own. He now faces Andy Roddick who powered past the tricky Tomas Berdych in straight sets – impossible to call that one. Tommy Haas and Novak Djokovic continue to impress as they meet each other in the other quarter final in Federer’s half. Murray has the easiest match – facing a Juan Carlos Ferrero who despite looking rejuvenated just doesn’t possess the game to hurt the British Number one. 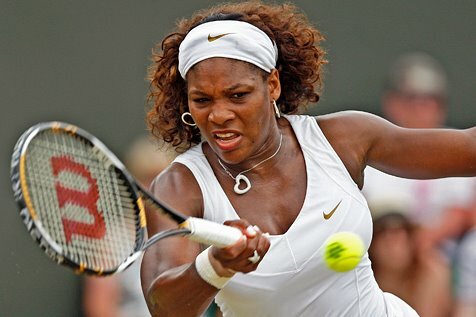 The Women – playing their quarter finals as I type, failed to produce such drama and quality across the field. Daniela Hantuchova decided not to turn up against Serena Williams wilting weakly 6-3, 6-1 whilst sister Venus had an equally tough ride through the fourth round when poor Ana Ivanovic tearfully retired after losing the first set 6-1. Elena Dementieva looks very strong however after another blink and you’ll miss her performance beating fellow Russian Elena Vesnina 6-1 6-3. Ridiculous screecher Viktoria Azarenka fought back against a disappointing Nadia Petrova (who had her blood pressure taken in the mid-afternoon heat), whilst there were wins for Francesca Schiavone and Agnieska Radwanska – the latter conquering ‘Oudini’. Safina’s strong willed battle with Amelie remained the highlight – and the Russian deserves another shot at a major final. Thanks to Official Wimbledon site for pics. Awesome review of some of the day's action! I especially loved your comments on Murray-Wawrinka! It was some awesome stuff.